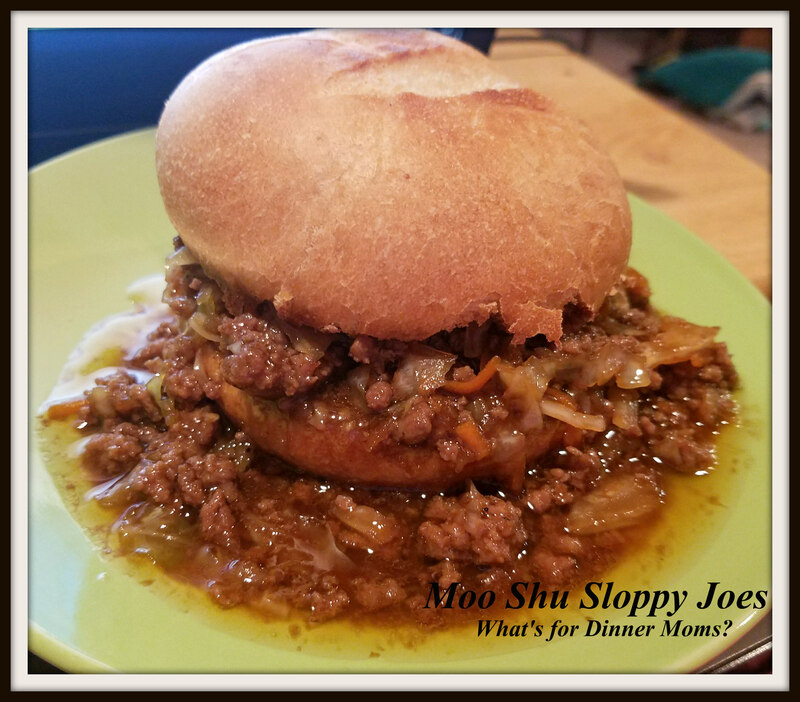 Moo Shu Sloppy Joes – What's for Dinner Moms? Things have been difficult lately. I hate the feeling of everything being rushed and nothing quite completed the way I would like it to be. I feel like I am on one of those hamster wheels that is about to go off the track. We have actually been eating out more because we are on the road and I need to get back to the plan. Making sure over the weekends or when I actually have a few hours at night that I plan ahead. Meaning take the meat out of the freezer, prepping vegetables and bringing up the staples from the pantry to make the meals. It just needs a bit more thought on my part. One of my most favorite parts of cooking is taking dishes we like and turning them into something new. We love Chinese foods such as Moo Shu Pork so I thought why not turn them into Moo Shu Sloppy Joes? I also want to make a Chinese based pizza. Maybe Moo Shu Pizza or Orange Chicken Pizza. But, Moo Shu Sloppy Joes just seemed to go together since they are usually served with thin pancakes. The entire family loved these! The sauce had more than enough flavor. Even my most pickiest son said, “These are amazing!” Usually that sentence is followed by a but…. this would make it better. Not last night! I served these with a green salad and baby carrots to complete the meal. Heat oil in a skillet over medium heat to warm. Add ground beef and onion to pan. Cook ground beef until no longer pink, breaking the meat into tiny pieces. Once the meat is completely cooked through drain any remaining grease from the pan. While the ground beef is cooking mix the sauce ingredients in a bowl until well blended. Once ground beef has cooked add sauce mixture, coleslaw mix, and mushrooms to the ground beef and continue to cook over medium heat. Once the mixture has heated through and the coleslaw mixture has wilted remove pan from heat. Taste and adjust spices to your liking. Serve over toasted hamburger buns. Sounds delicious. I just bought some hoisin sauce, just because. Now I have something to use it in! Wow, this is pure genius!! I love this idea and they do look so deliciously sloppy!! Comfort food with a global twist! Thank you! I love turning foods we love into new dishes! I’ll have to try this! I can’t have any type of tomato (I really miss sloppy joes, spaghetti, etc.) this looks like a great alternative that will satisfy those cravings! It definitely has a different flavor but does fit that loose meat sandwich category. It really looks good. Thank you for sharing it!